As a result of large recent natural gas finds in the Utica shale, the state of Ohio has immediate access to tremendous volumes of natural gas. Second only to the nearby Marcellus find that stretches across several states in the Appalachian ridge, the Utica shale is sure to have widespread impacts on Ohio’s warehousing and manufacturing sectors, the latter of which ranks second in the nation. The skyrocketing price of oil coupled with major federal and state tax incentives is causing Ohio warehouse and manufacturing facility owners to quickly convert existing oil and other non-gas systems to natural gas or upgrade existing gas heating systems to more energy-efficient gas heating systems. The state’s three largest cities – Cincinnati, Cleveland, and Columbus – are especially likely to experience a seismic energy shift, as they constitute Ohio’s major warehousing, manufacturing, and distribution corridors and all place within the top 20 manufacturing cities nationally. 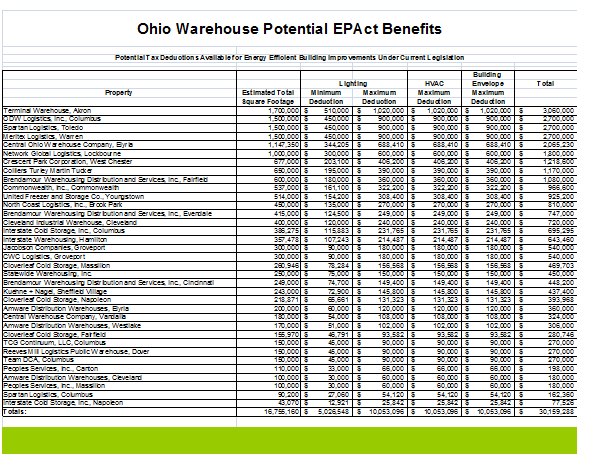 Pursuant to Energy Policy Act (EPAct) Section 179D, commercial property owners in Ohio making qualifying energy-reducing investments in their new or existing locations can obtain immediate tax deductions of up to $1.80 per square foot. Eastern Ohio’s Utica Shale has rapidly become the state’s natural gas reserve for the ages, with millions of acres for drilling and billions of dollars being pumped into the state’s economy by energy companies looking to capitalize on the find. The size of the Utica find is vast; in fact it is geographically twice the size of the Marcellus find. Further, Ohio benefits from its close access to the western portions of the Marcellus shale as well, making Ohio one of the leading natural gas sources in the country. The timing couldn’t be better. Oil is simply proving too costly and volatile to remain the primary energy source for manufacturing facilities and warehouses. If soaring prices on traditional fuel sources weren’t enough to motivate policymakers and property owners to consider using natural gas to power building heaters, the recent nuclear crisis in Japan and the BP oil crisis in the Gulf of Mexico have served to embolden natural gas supporters. It is highly likely that over the course of the next several years there will be a bigger push towards utilizing the tremendous amount of natural gas that has been found in Ohio and elsewhere in New York, Pennsylvania, and New Jersey especially when one considers the staggering size of the Utica and Marcellus finds. Federal and state policies are currently aimed at incentivizing commercial property owners to install natural gas heating systems, which are cleaner burning and more efficient. One of Ohio’s leading utilities, Vectren Energy, supplies natural gas and offers a variety of large rebates to encourage theses conversions. The Utica Shale find is creating a vast supply for Vectren and other utilities to draw on in providing warehouse and manufacturing facilities cheaper, reliable natural gas for their building heating systems. Historically, Ohio’s economy has a legacy of being highly manufacturing intensive. As of 2011, according to some Ohioan analysts, Ohio is home to 21,250 manufacturing companies and the state leads the nation in production of general-purpose machinery and is second in metalworking machinery production. Of all U.S. cities, Cincinnati ranks sixth in the United States for manufacturing jobs, Cleveland is 10th and Columbus is 19th. Iron, rubber, cars and consumer electronics are giving way to advanced machinery manufacturing, so that Ohio's machinery workers are now literally making the machines that make everything else as product manufacture goes overseas. Legacy industries within Ohio's manufacturing sector are adjusting so that, for example, the state's historic rubber companies are engaging in advanced plastics applications, and chemicals firms are on the cutting edge of fuel cell and other alternative energy creation solutions. All of these processes are highly energy-intensive and therefore manufacturers will be eager to reduce their operational expenses by making the switch to natural gas if they haven’t already. Many of these facilities were built generations ago and are very energy inefficient compared to today’s technology. Manufacturing facility and warehouse owners are converting to gas to obtain substantial cost savings, primarily from existing oil systems or other less efficient heating systems. But the economic impacts of the Utica find will not only come in the form of decreased operational expenses to warehouse owners and manufacturers; it will also directly prompt the construction of many new manufacturing and warehousing facilities. For instance, plans to build a steel manufacturing facility in Youngstown, Ohio have been announced, as the French firm Vallourec & Mannesman Holding plans to produce steel parts for the fracking equipment used when drilling for natural gas. In order to facilitate the transportation of the increased manufacturing output, Ohio’s three largest cities have evolved into distribution hubs, especially as they are positioned as gateways between the Midwest and Eastern seaboard. Many of the nation’s largest retailers have distributions centers in Ohio, ranging from Kohl’s to OfficeMax, all of which occupy a substantial amount of square footage and therefore require a large amount of energy. The largest energy expense for most non-conditioned warehouse facilities is lighting. However, this fact actually helps building owners who are seeking large natural gas heating deductions. Importantly, the pathway to these large natural gas heater deductions is to first upgrade to energy efficient lighting, which most of these buildings have done or are in the process of doing. In January of 2011, IRS issued Rev Proc 2011-14 allowing property owned to recover, or claw back, EPAct tax deductions. Commercial buildings that previously upgraded to energy efficient lighting, but were not able to realize tax deductions above $0.60/square foot even though overall building wattage was brought down the requisite amount, can now use the 3115 procedure in order to recover previously missed tax deductions; or trigger new tax incentives that can be used for roof and building envelope improvements. To obtain the $1.80/square foot deduction, which requires an overall 50% energy cost reduction, the typical mix is 40% to 42% cost savings from lighting and 8% to 10% from the natural gas heater. 1)The tax planning opportunity is to first make sure that the lighting wattage is reduced to the level that will enable the lighting/heater combination to qualify for multiple EPAct tax deductions. 2)If the lighting has already been retrofitted to a qualifying wattage level, the technique is to install the natural gas heater for a current tax deduction and use the form 3115 claw back for the previously missed lighting tax deduction. Throughout Ohio industrial and warehouse property owners are moving quickly to capture the large cost savings from natural gas heating systems conversions arising from huge local natural gas finds. Those who already have or concurrently install energy efficient lighting can obtain large tax incentives that greatly improve the economic payback from these conversions. Charles R. Goulding Attorney/CPA is the President of Energy Tax Savers, Inc., an interdisciplinary tax and engineering firm that specializes in the energy-efficient aspects of buildings. Spencer Marr is an Analyst with Energy Tax Savers, Inc.